How amazing does that look!? And oh how does my head hurt trying to understand the complexity of it! Can’t wait to see it in motion with a little loco on top! Thanks. It has definitely been an interesting challenge. The whole shebang is best regarded as several subsystems. What makes it a bit more interesting is my requirement for two separate power supplies, DC and DCC. I have been looking into the polarity switching issues. There are not that many electronic modules out there, those that will work with the low power output of the NCE Powercab (1.7A) and are not relay-based are expensive ($65+). A DPDT switch may work as the locomotive all have stay alive capacitors. Or the cheaper Digitrax polarity switcher which is relay-based and around $25. I'm with Chris on this one - amazing modelling and application but my head is buzzing trying to understand it all. Thanks. I wonder myself at times. A worksheet helps, although quite frankly I'm making this up as I go along. Some more work over the weekend and today. Wiring. DCC wiring competed except for the wipers on the copper disc. 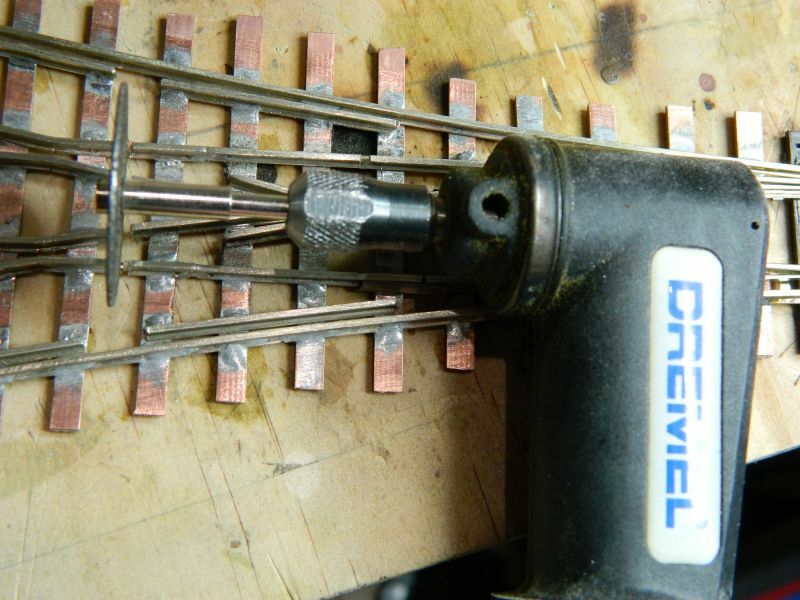 I used thin brass, continuity was OK, but started to be sporadic after 20 minutes running. They will have to go. 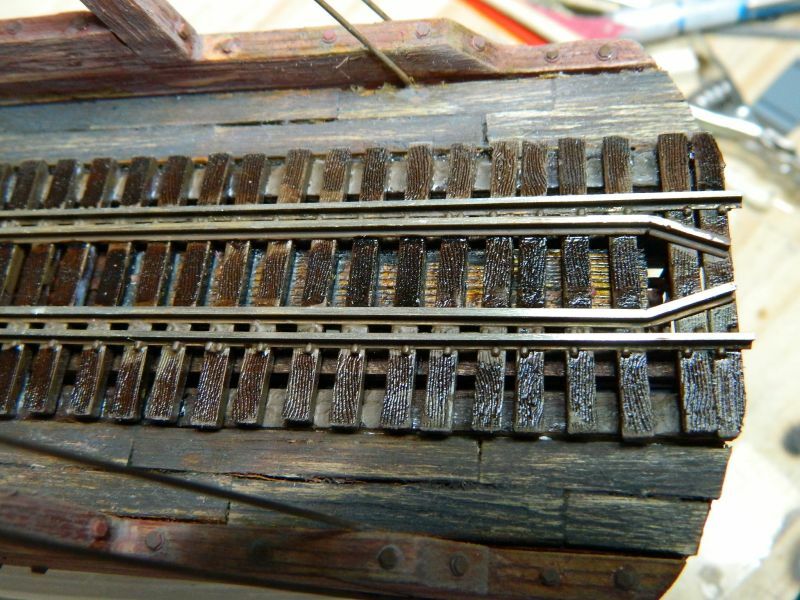 I did find some phosphor bronze wiper strip in the spares box. 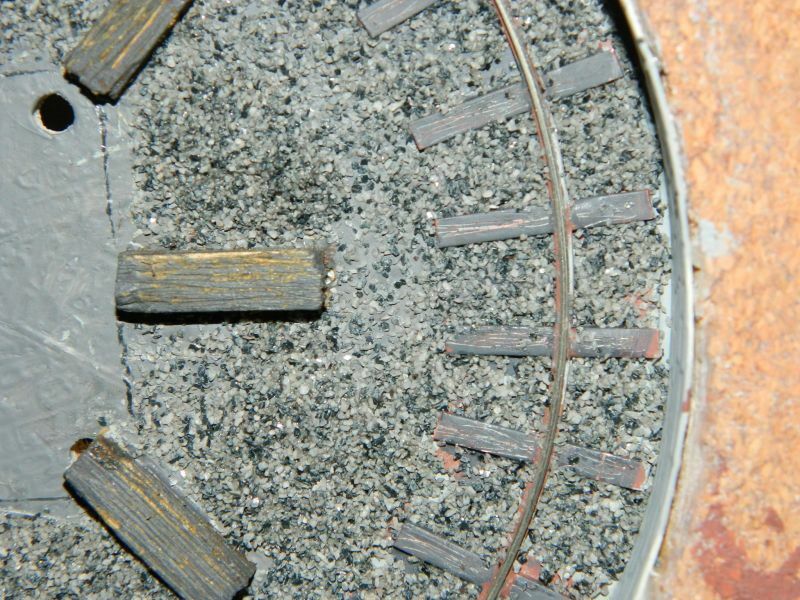 The copper clad strips glued to the base of the well will get disguised as 2 of the eight spider's legs. 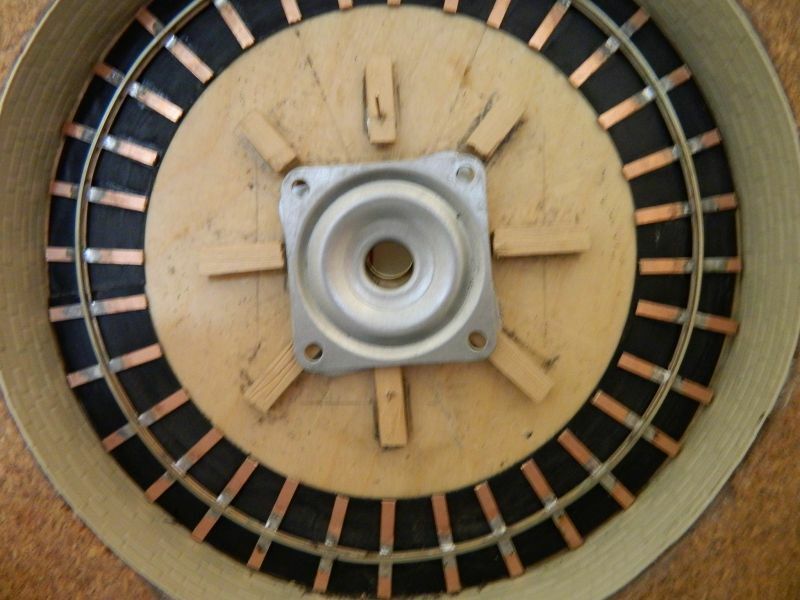 Motor torque controllers. See photo. They now have some foam interiors. Bridge. I fabricated some planks to go between the rails, and laid some more planks on the walkways. Thank you Starbucks. Photo 1. Turntable bridge almost complete. 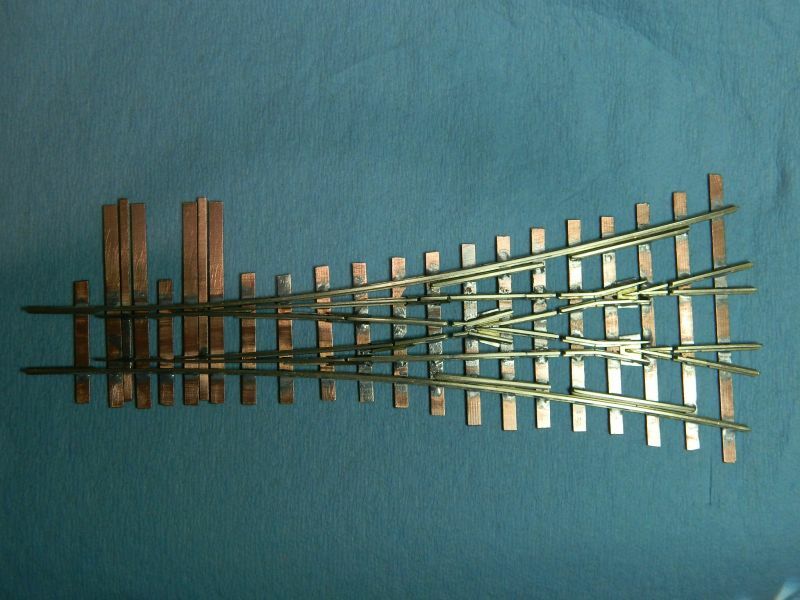 Track is Micro Engineering code 83, On30, with the ties (sleepers) compressed. The brass wiper is visible on the spider's leg. 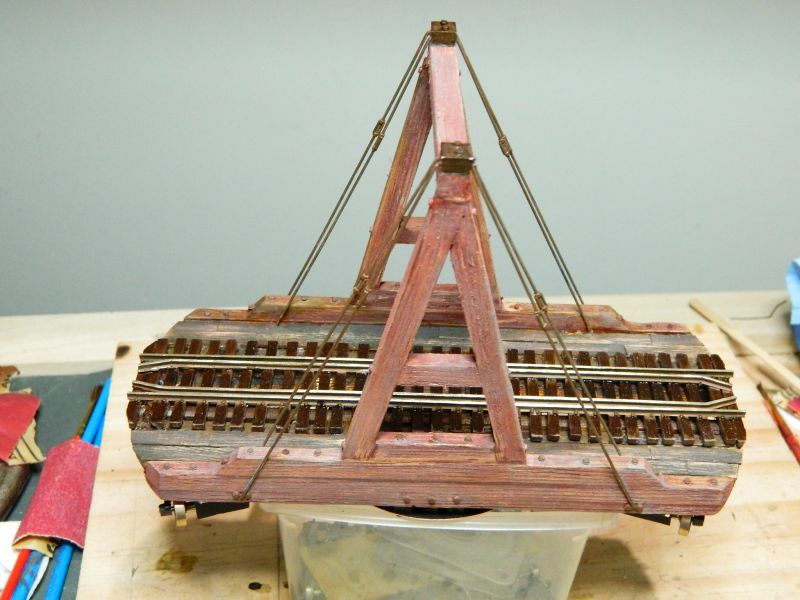 Rail and ties in the well glued in place with plastic-compatible CA. Underneath the turntable. 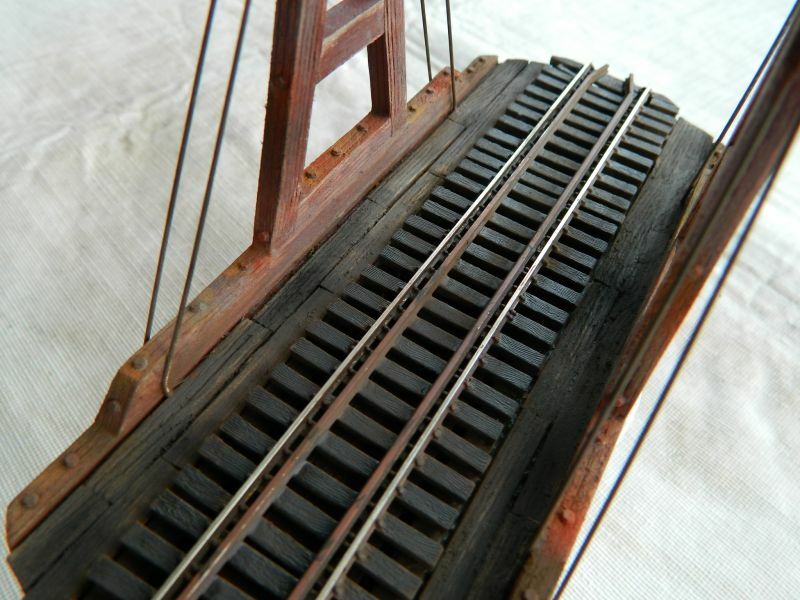 Red and black wires are the DCC supply to the bridge rails via the well rail and bridge disc. 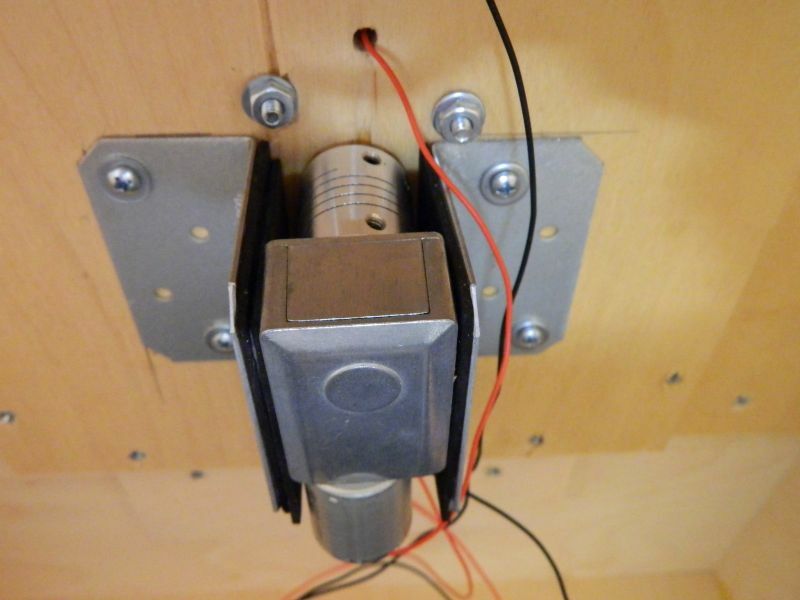 Motor and gearbox located between the brackets and cushioned with foam glued to the brackets. PWM controller/speed control/reversing module for the DC circuit to the motor, and the polarity reversing module for the DCC circuit, yet to be installed (somewhere, I need to locate some circuit boxes or perforated covers). And for those fans of grass growing, a locomotive on the turntable. Nice smooth operation Nigel and seems very quiet. Didn't realise how long your locos were until seeing the video, bit longer than my O-16.5 ones although a smaller scale. I know a lot of people use the Bachmann On30 Gas Mechanical on UK based layouts, even if it's actually a bit small scale wise for UK prototype, but yours must be a bit longer. Thanks. The gearbox whines a bit at 12v, silent at 4-6v. It has a big can motor, low rpm, so intrinsically quiet. The Atlas one is intrinsically noisy (low torque, high rpm) one of the reasons I didn't use it. The locomotive shown started out as an etch body kit from A1 Models in the UK, sits on a Bachmann chassis. 1:43 7mm scale rather than 1:48 6.5mm scale. 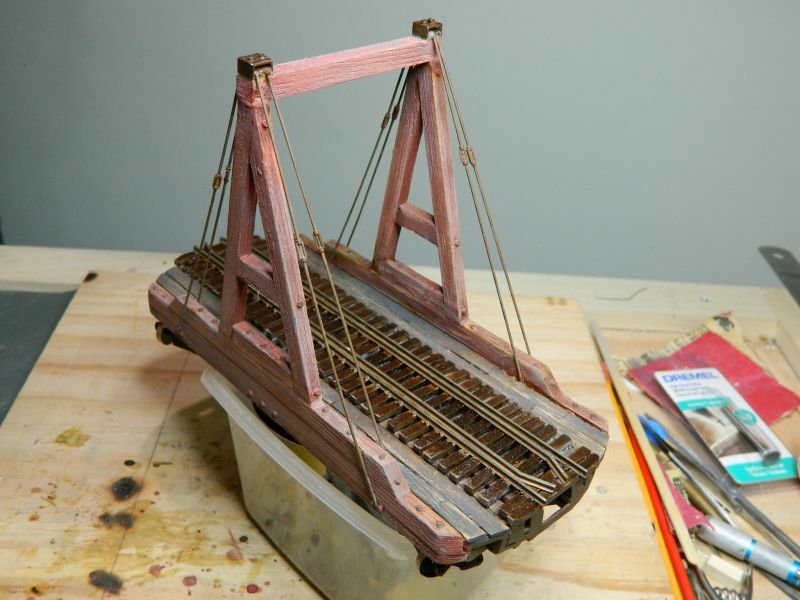 The turntable bridge is only just over 7" long, it will just take that 0-6-4 Forney locomotive that is in next on the rolling stock build list. Once I can work out how to get the body shell off the Bachmann donor. Bit more work last night and some shopping today. Spider. 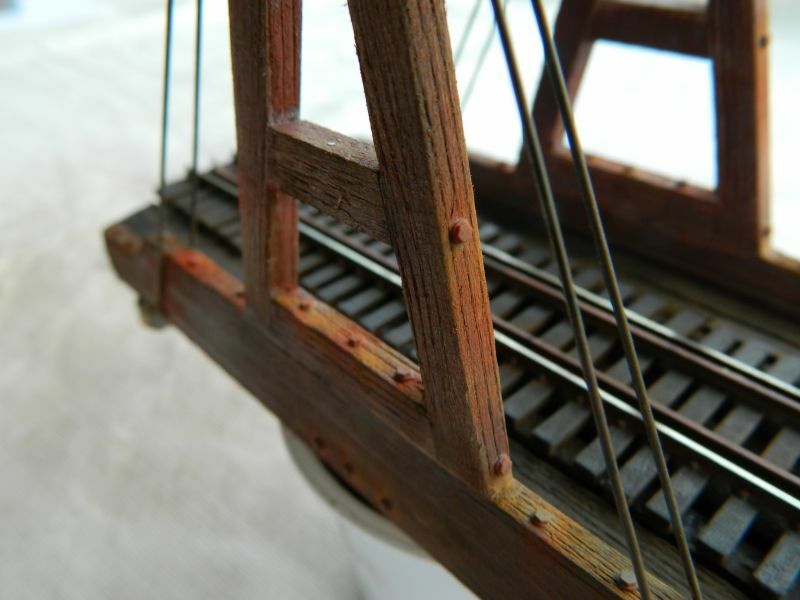 One of the characteristics of the Gallows or A frame wooden turntables was that the central pivot consisted of some 16 rimless wheels riding on a circular piece of rail, attached to a "Spider" consisting of 8 substantial timber legs. The central rimless wheels I left out, I did a mock-up of the timbers, making some allowances for the bearing and screws. New pick-ups for the copper disc. I replaced the brass contacts with some 0.032" diameter phosphor rods embedded through the copper clad (and soldered in place) and cosmetic timber legs. I just finished running the turntable for 30 minutes (15 minutes CW, 15 minutes CCW), no issues with maintaining continuity. Job done! 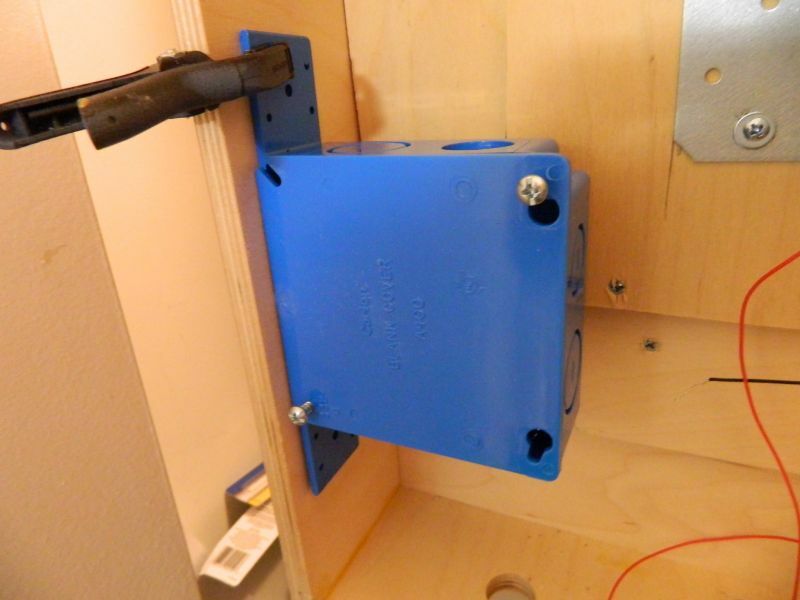 After a bit of head scratching over the price of electronic project boxes I picked up a couple of electric circuit knock-out boxes and cover lids (4" x 4"). 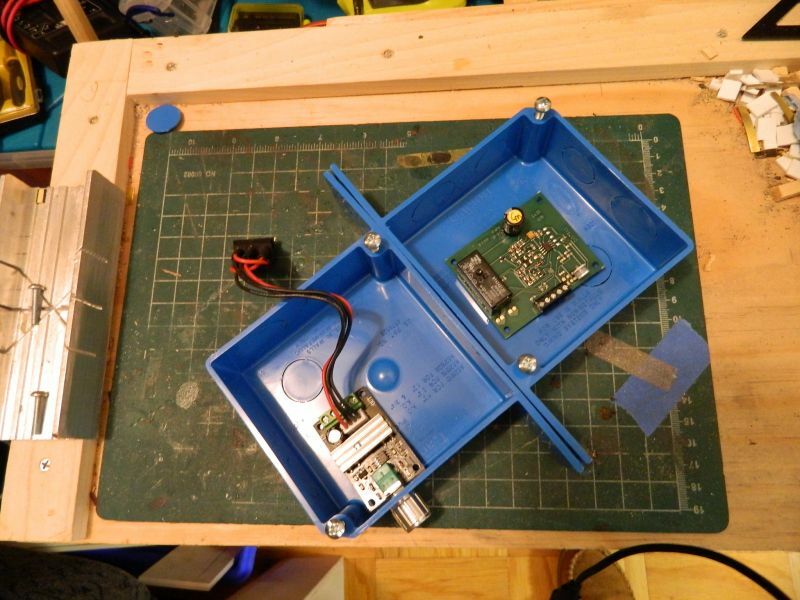 Tasteful shade of blue, should protect the circuit boards for the PWM controller and polarity reverser. And at less than $4 for the boxes and covers a lot cheaper than ventilated project boxes (around $10 each).The idea is to attach them to the sides of the frame, use the knock-outs for wires and ventilation. Swivel top, so accessing and adjusting the pots on both boards will be easy. 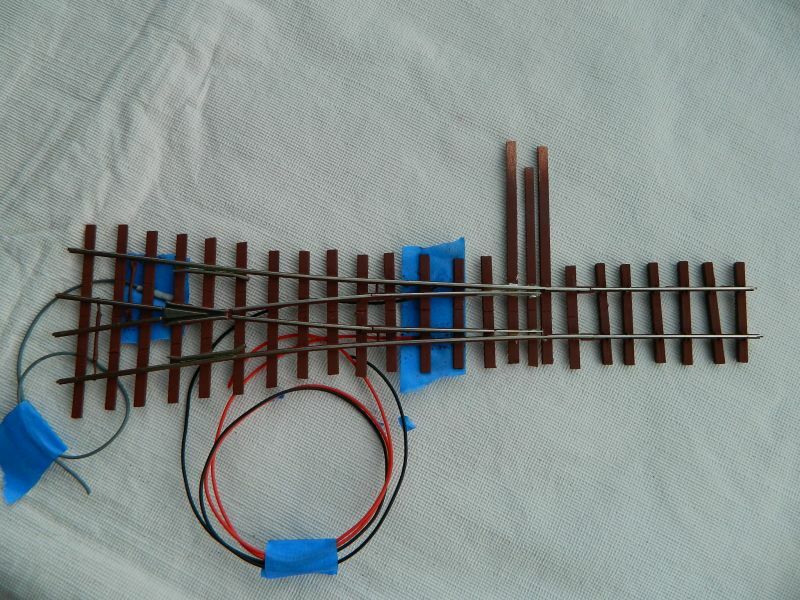 Phosphor-bronze contact for turntable rail DCC supply. Knock-out boxes and the PWM and reverser modules. Plenty of room for ventilation (note the heat sink on the PWM module, LHS). Where the boxes will be screwed on the inner face of the frames (one each side).. Wish I was as good at "making it up as you go along "
Thanks. First go at building a turntable, all the reading in the world doesn't help that much when you want one in O scale and with a 7" diameter. I am pleasantly surprised that it actually is coming together and working. Looks like we have a new recruit to the erstwhile team of Blodgit and Fudgit - Wingit. 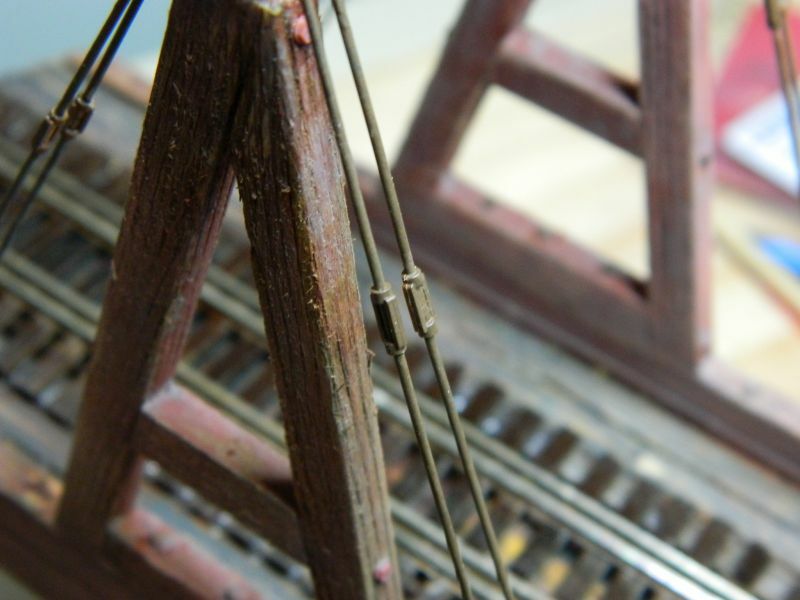 Some detail work on the turntable, and a #4 wye that will serve as one of the tracks onto the turntable. 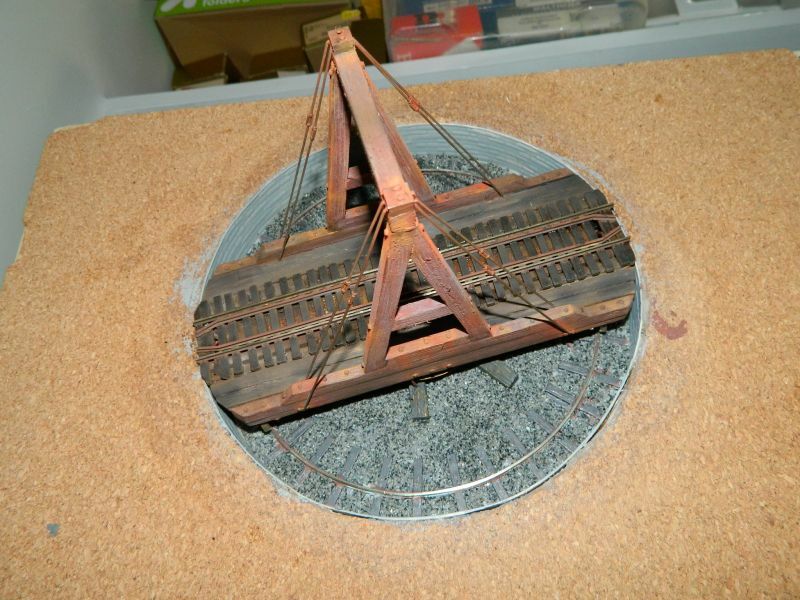 The turntable has had a very light wash with grey over oxide red, both coats lightly rubbed down with #400 paper to give an impression of a long time spent in the sun. 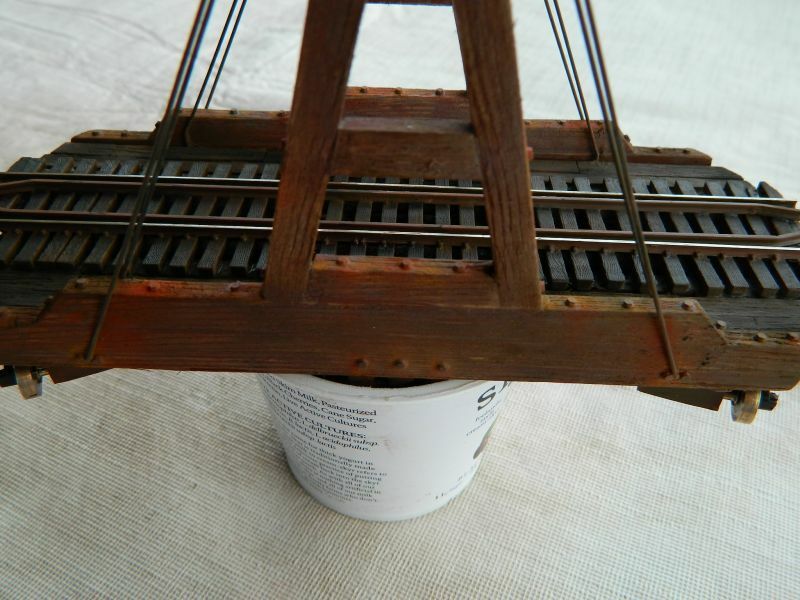 The bridge floor had a coat of oily black, followed by a rub with #400 to represent wear. Stay wires and turnbuckles in place, along with some scaled 4" bolt heads and washers. 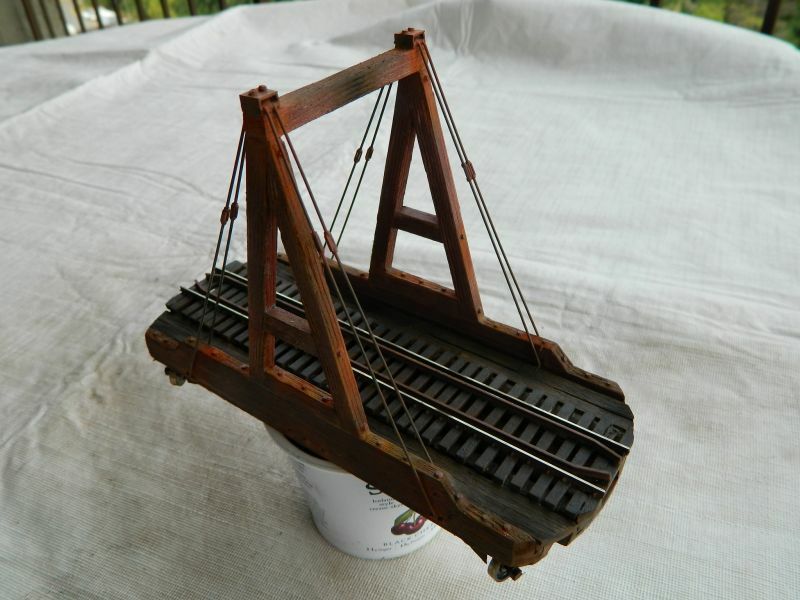 The ties (sleepers) were given a coat of dark umber india ink, and will get a light dusting with grey weathering powder after the check rail heads have been rusted/blackened. Plus some rust streaks here and there from all the stay wires/bolts, the turnbuckles, and the metal stay box covers on the top beam. After that final bit of detailing it will be time to get it all wired up underneath and tested. The wye uses a frog from an old Atlas #4 code 83 HO turnout. Recycle, waste not.The copper clad needs some more grain before priming and painting. 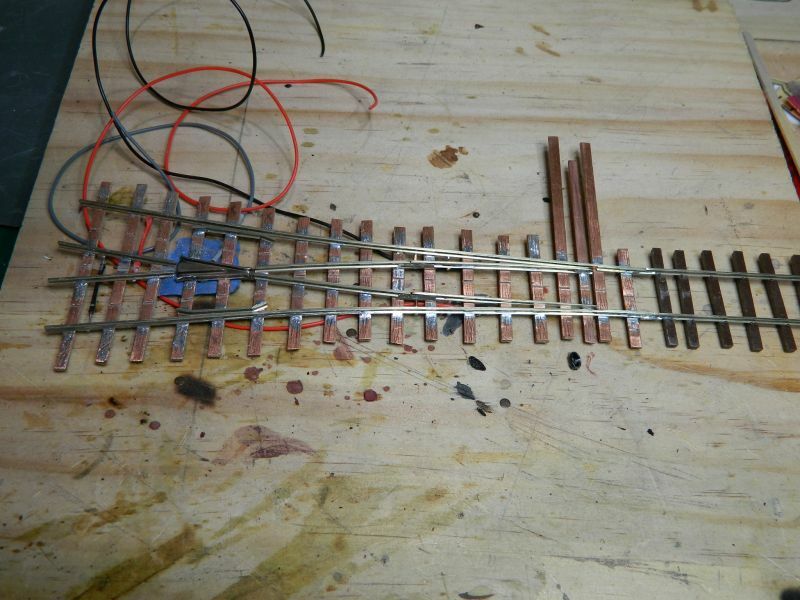 Wired for DCC, droppers soldered on the underside of the rails, and the frog wired as well. 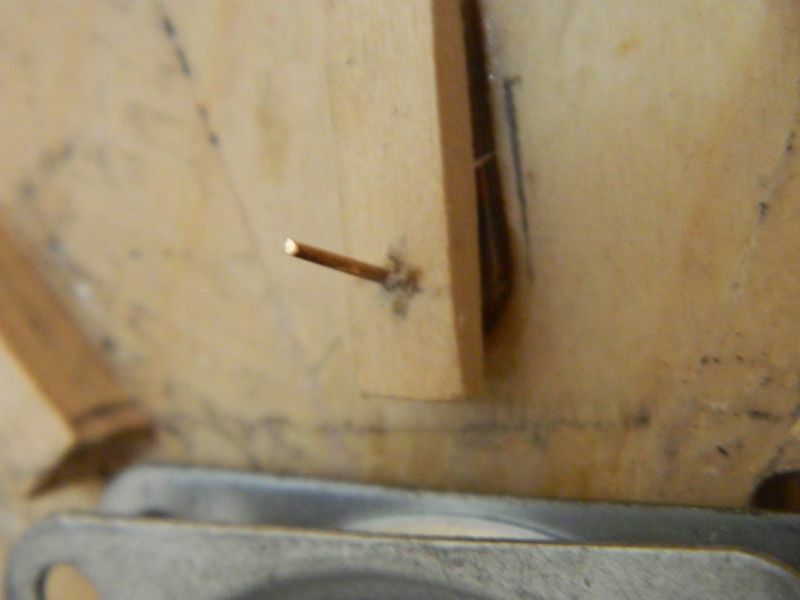 My usual method of using rail joiners as the hinge for the closure rails/point blades. 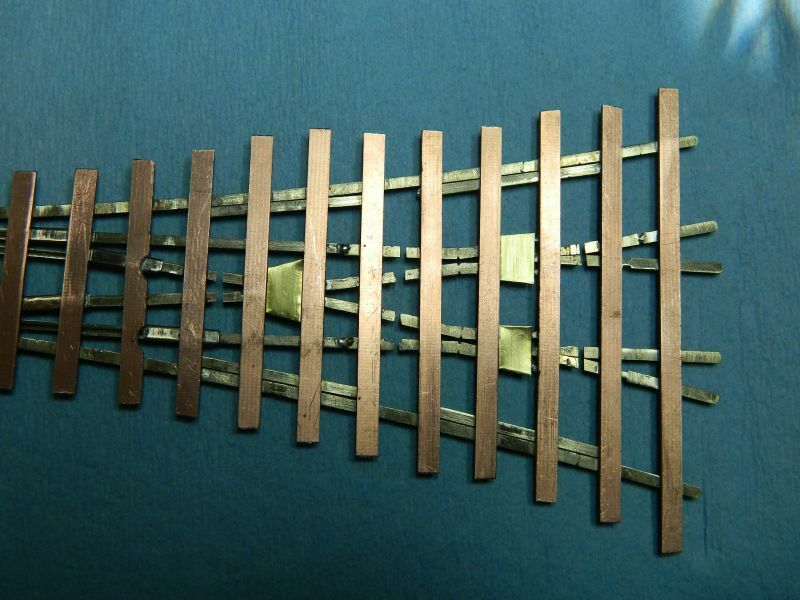 The copper clad ties will need some packing underneath to match the height of the Micro Engineering code 83 ties.One large piece of thin 3 ply birch cut to shape will be the easy way for this. Nice afternoon, so some weathering of the turntable with powders (best done outside), and a coat of red oxide primer on the wye. Now that Nigel, looks absolutely lovely. I know it works really well and prototypically as slow as you may wish, but, the fit and weathered finish is outstanding. Thanks. It's fun, that's the aim of the game. Gravel time! Nock OO scale granite, laid on PVA/IPA/water (75/5/20 v/v) painted on with a brush. Random heaps around the well after using a dropper followed by granite to give some 3D relief. 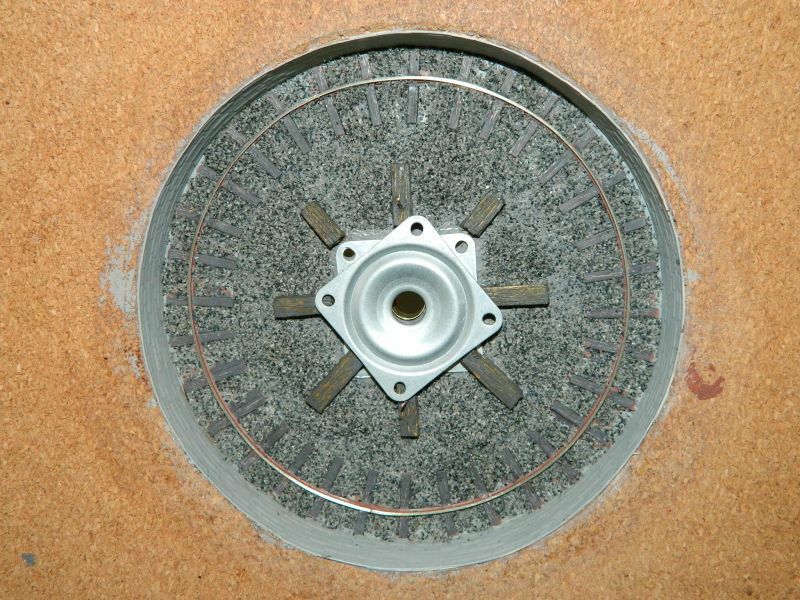 Dribbling glue over granite definitely not allowed, ganite is always last. Avoids that shiny look! Still needs a bit more around the spider's legs and the edges, and some weeds. I used masking tape where the bearing plate sits. I'll paint the corners of the bottom plate dark grey with black speckles so it blends in more with the granite. Copper clad ties (sleepers) painted with a mixture of grey, black and rust (not an homogeneous mix) over grey and rust coats. Attacked with the "graining" tool when dry to expose some rust red and grey. All paints Vallejo flat acrylics. Minimal granite on the ties/spider legs except where intended .Light dust with weathering powders tomorrow. May put some rail spikes in. I also have some rail chairs somewhere from the EM days. Decisions, decisions. Looks absolutely ace! The finishing touches are great! Thanks. Interesting challenge on the cheap. Now comes the track laying and #4 turnout building. Slight diversion/distraction this week - the Three Way Turnout. I used a Peco code 100 symmetrical turnout as the starting point, converted to On30 ties/sleepers with a lot of bodging and bashing. A lot shorter than the asymmetrical one, but it only comes in code 100. Calculating the central frog angle was fun, Peco and standard frog angles are like ships in the night in code 100. It's around a #4.7. New central frog, new closure rails, physically isolated frogs, rail joiners as hinges...the usual stuff. The only thing left to do now is the complex point blade system. 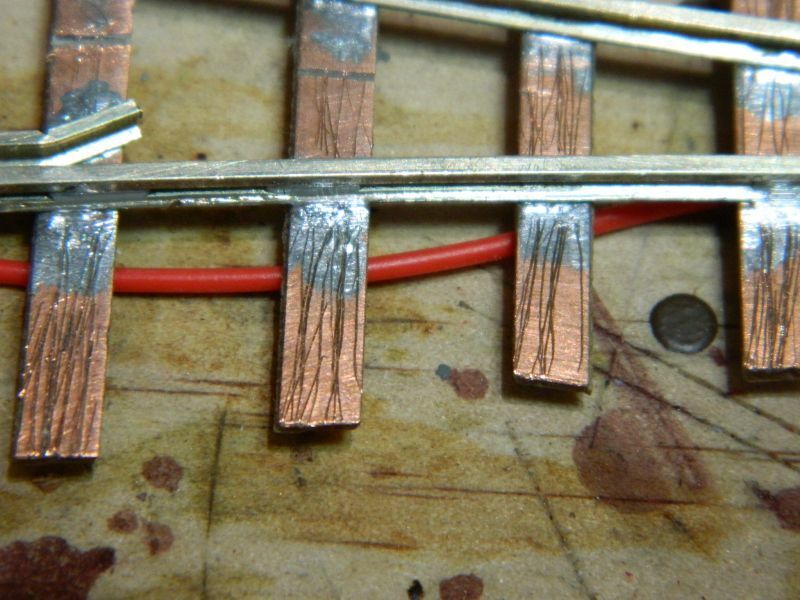 May have to use slots when soldering. Still thinking about that one. There should be a way to use copper clad. Very important, as the transition from code 100 to code 83 is almost spot on if I use them. Plus some contact plates under the two exit frogs for wiring. Fiddly soldering, but it's getting there. 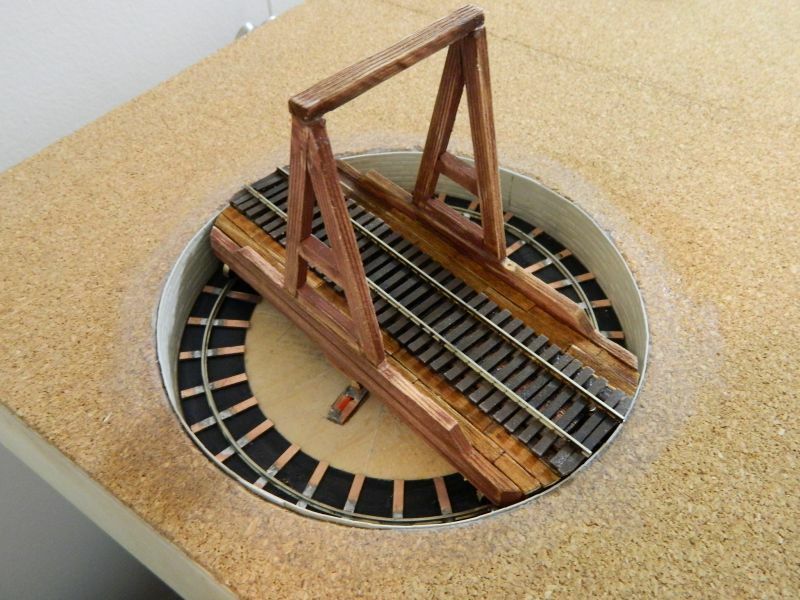 The three-way goes at the opposite end on the board to the turntable, which is entered using the #4 wye that I previously built. 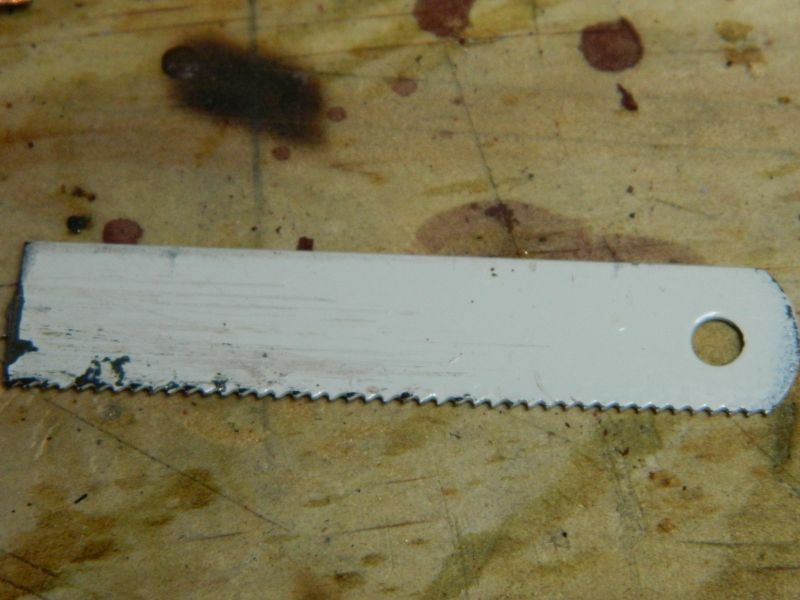 Last photo is the Dremel in slicing action using the right angled attachment and a cutting disc (0.04"). Useful for 90° cuts (± how steady the hand is). 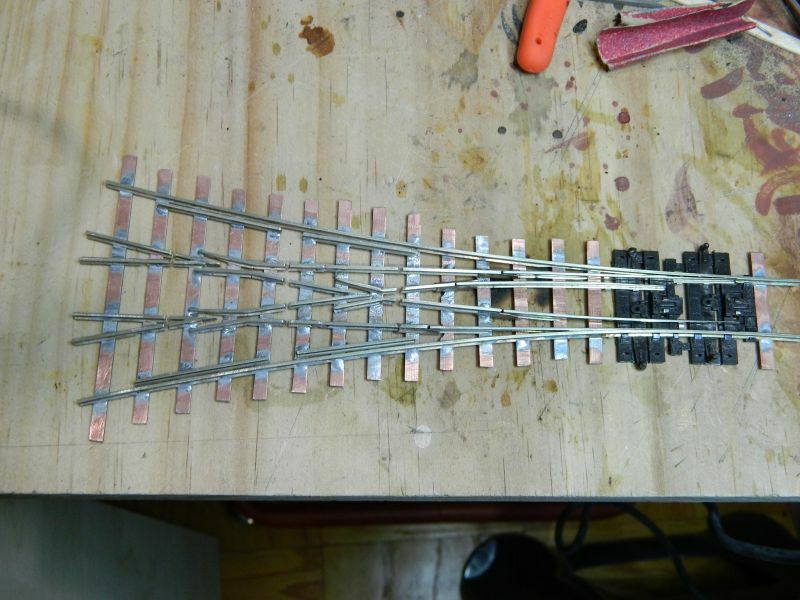 I wrapped up soldering the 3-way turnout tonight, all that is left to do is the insulating gaps (epoxy filler I think, although they have no effect on running bogie stock as is) and frog wiring/jumpers. 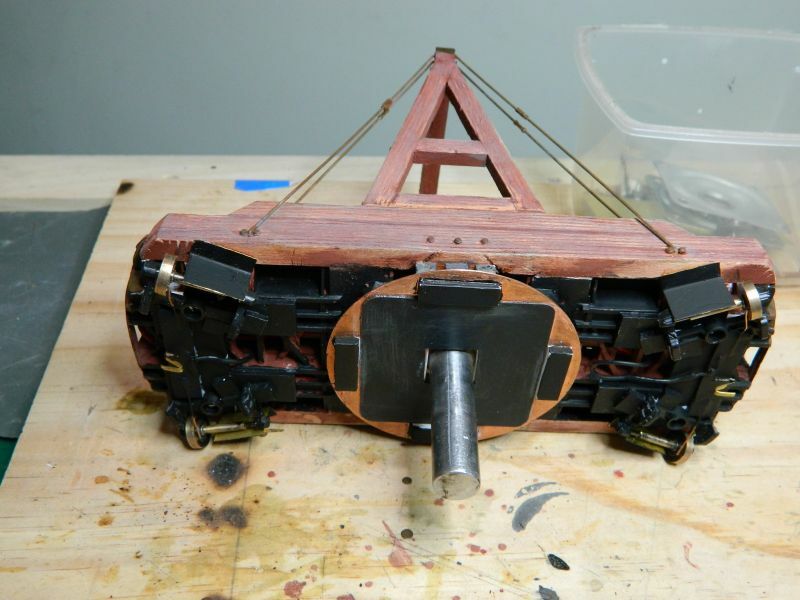 I have a couple of shorty 0-4-0 locomotives in the plans, they will definitely need powered frogs. 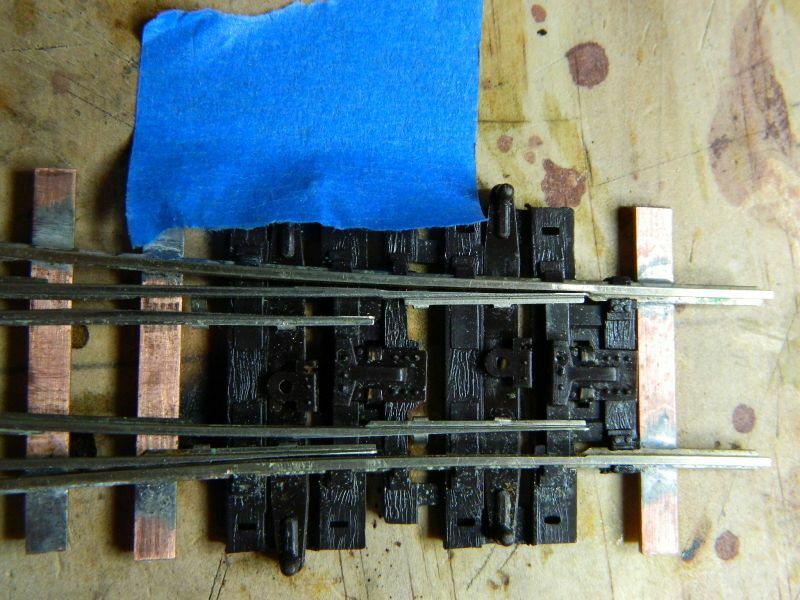 The photo of the back shows the brass plates soldered under the 3 frogs that will take the frog wiring.The narrow width copper clad I use for ties bars comes from a company called Clove House. I use seconds, as these are usually too narrow for HO. Ideal for tie bars in On30 though. 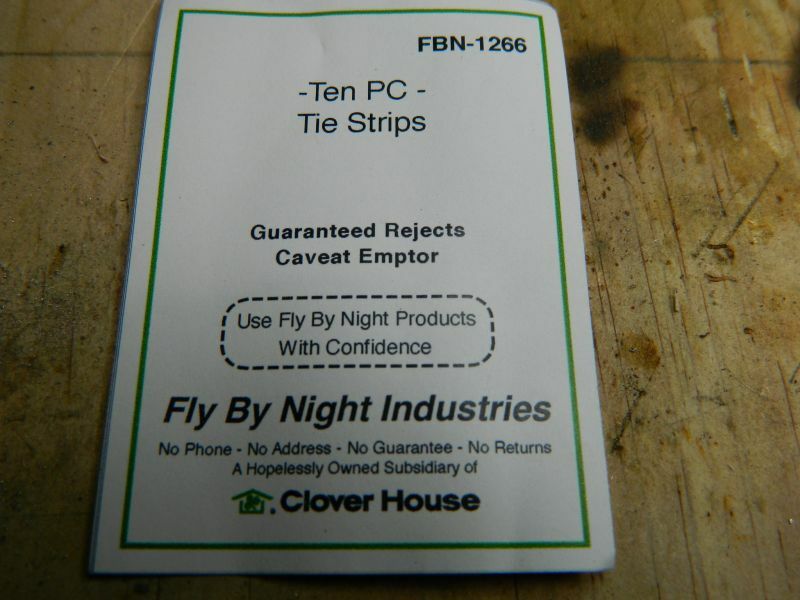 And at around $2:50 for ten 12" long strips a bargain. The turnout is about 10" long.